10th Year Anniversary re-release. 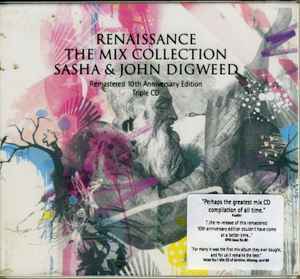 Remastered by Sasha & Digweed. This version does not include Renaissance or How Can I Love You More by M People, both of which were included on the original release. They were replaced by "Stand Above Me" by OMD, and "I Can't Forget You" by Anthony White. The cover art was redone by a New York illustration collective known as Vault 49, and new liner notes were contributed by Dom Phillips, editor of Mixmag magazine. 1-11: track title incomplete; just shown on release as "Didn't I Show U Love", without the beginning part. 3-07: missing "Suite" from the track title.